A family tree is an excellent visual tool for exploring your family genealogy. Whether you are retracing your heritage for a school project or wanting to learn more about your family, researching your family tree history can help you uncover a deeper understanding of who you are and where you came from. 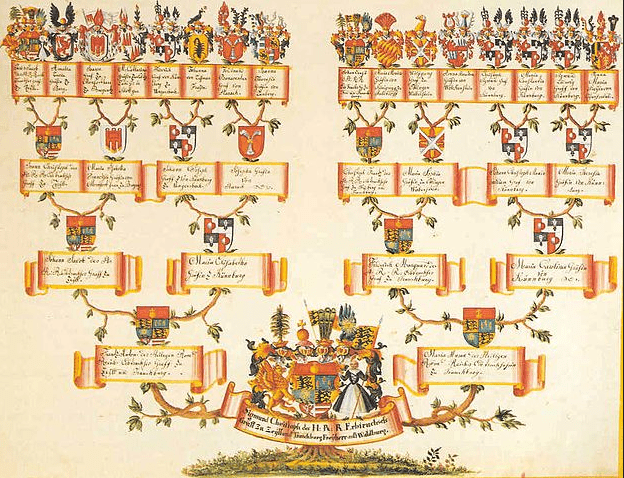 Illustration: the family tree of Sigmund Christoph von Waldburg-Zeil-Trauchburg, late 18th century. Credit: Wikimedia Commons. Despite the seemingly simple concept of the family tree, there are specific genealogy and kinship terms that can be confusing to understand when starting your family tree research. With that in mind, we’re sharing this guide to explain the different family tree relationships. When attempting to build anything other than your immediate family tree, you will inevitably run into some new terminology. “Affinal” and “consanguinity” are the two most important of these often-unfamiliar genealogy terms. Understanding their definitions is critical, as they will take you down two very different paths. Consanguinity is translated directly as “of the same blood,” or in other words, a blood relation. Your parents, (great) grandparents, uncles, aunts, brothers, sisters, and cousins of various degrees are all a part of your consanguine family tree. When exploring your family tree history, it is important to make the distinction between those to whom you are bound by marriage and those to whom you are bound by blood. The rest of this guide will exclusively explore the blood relationships. However, you can just as easily apply many of the kinship terms used for blood relations to your spouse or partner by adding “in law” as a suffix to their title. When constructing your family tree, it is essential that you consider the irreplaceable roots without which you would not exist: your parents, their parents, and their parents’ parents. Your grandparents can be the key to correctly placing your uncles, aunts and their children (your first cousins) into your family tree. Great-grandparents and great-great-grandparents are often harder to trace, connect, and find a record of, as there are many branches of cousins that emanate from them. A great-grandparent is the parent of your grandparent and a great-great-grandparent is the parent of your great-grandparent. The generation gaps that exist between great-grandparents (and beyond) and ourselves can often lead to a loss of information and family records. As such, tracing these relatives can help you find other ancestors and expand the branches of your family tree. During family gatherings and your research, you may have heard the phrase “third cousin twice removed” and marveled that anyone could possess such a relation. 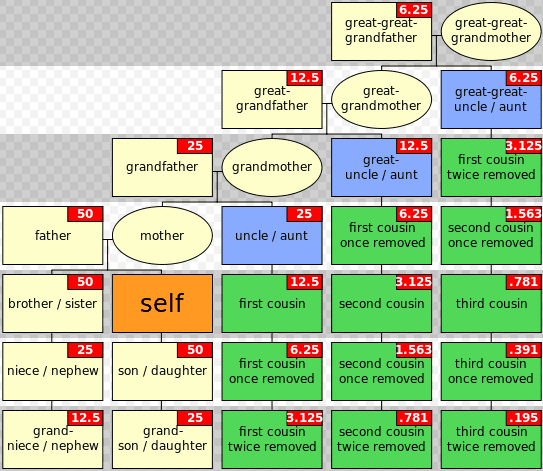 It’s quite common to have third cousins twice removed, not to mention a whole slurry of other seemingly impossible family tree relationships. Illustration: a chart illustrating the different types of cousins, including genetic kinship marked within boxes in red which shows the actual genetic degree of relationship (gene share) with “self” in percentage (%). Credit: Gringer; Wikimedia Commons. First cousins: those who have the same grandparents as you but are not your siblings. Second cousins: those who only have the same great-grandparents as you. Third cousins: those who only have the same great-great-grandparents as you. The term “removed” is a signifier of how many generations apart you are from that specific cousin. For example, your second cousin twice removed is the grandchild of your second cousin, as they are removed from you by two generations. While understanding and tracing all these relationships can be confusing, a table of consanguinity exists to save us all from the headache of counting our family tree relationships out. The table helps to take you step-by-step through your relatives, from your great-grandparents to your great-grandchildren and everyone in between. Establishing how everyone is connected can help you learn more about your ancestors and trace the different families in your family tree. What’s Next? Build Your Family Tree! A family tree can go back many generations and expand across many related families. However, tracing every relative and their records to help fill in all the details can be difficult. Memories fade, family records are lost, and stories are forgotten. After collecting as much information from your relatives as you can, use online genealogical resources to help you learn more. Local newspapers published countless stories about the people in their communities. Many newspaper articles are the only remaining record of an ancestor. Use GenealogyBank’s Historical Newspaper Archives to research and get to know the people behind the names on your family tree. I am wondering if there is a numbering system for the various positions on a family tree? Sorry I’m late to the party. That said, I devised a generational numbering system for identifying my ancestors, as well as other relatives and inlaws. I’ll be happy to explain if you are still interested. You can choose the one that best meets your needs. This is helpful info, but still does not address what I think is a more important issue for many of us: what term can be used to describe a half-sibling raised by a different family than the birth family? For instance, my half-brother was adopted and raised by a wonderful family. I value his relationship to my mother and my immediate family, and I value my (more tenuous) relationship to his family of nurture. Likewise, my mother’s mother was adopted. While I am researching what I can, I may never know her birth parents -– only her adoptive parents, and records indicating THEIR parents. What term should I use to describe that relationship? I can tell you that I value the loves, positive values and cultural contributions those non-birth parents have introduced to my family line. To varying degrees, they HAVE shaped my current family. I’m interested in their family lines and history as much as that of my blood relatives. Surely genealogists have developed some terminology to use for these relationships. What if a child is adopted and not blood, but you want them a part of your family tree and they are not an in-law? Thanks. I would recommend reading through that entire article. It will give you insights on different options for creating family trees involving adoptions. Excellent point, KWight! As someone who gained two older siblings by adoption, I can appreciate your comments. These relationships are priceless, and language should find a way to address this situation in a respectful manner. “Your language requires a thoughtful approach. Certain words and phrases feel tainted with judgment to some people involved in the adoption process. Adoption professionals and social workers avoid potentially hurtful phrases by using Respectful Adoption Language. Especially if you are talking to adoption professionals during a search, it helps to speak their language. “It is more accepted to say a person ‘was’ adopted, not ‘is’ adopted. The process of legally joining a family took place in a courtroom long ago. Adoption is a legal process, not a condition. “‘Birth mother’ and ‘birth father’ replace ‘natural mother’ and ‘natural father’ to avoid implying an unnatural relationship between a child and adoptive parents. “Birth families ‘make an adoption’ plan rather than ‘give up’ a child. Consider how different those phrases sound, and how each might feel to sensitive ears. For legal adoption terms, check out https://family.findlaw.com/adoption/glossary-of-adoption-terms.html. As far as genealogists’ terminologies are concerned, it’s up to the individual genealogist which style of terms they ultimately opt to use. That said, we trust that you will be able to find and utilize the best terminology (in the aforementioned links) for yourself to better convey the spirit of those unique and wonderful relationships. This is a helpful article, but I notice that my specific question is not addressed, and the provided graphic left me still wondering: My “grand”mother’s sibling is my “great” uncle or aunt, but my sibling’s “grand”child is my “grand” niece or nephew. This strikes me as inconsistent, and I’m confused. If my grandmother’s sibling is my great, shouldn’t my sibling’s grandchild be my great also? Or vice-versa? I hope you have a consistent answer for me! Consistency is key for you to maintain your sanity as a genealogist, so brava for your aspirations for this quality of work! This interchangeability often causes some confusion on the part of people as to what to call people–be it “great” or “grand”. Ultimately, you’re right–consistency is key. If you opt to call someone “great” or “grand”, just make sure you define your terms beforehand. That way your consistency will help others’ heads stop spinning around the conundrum that is better known as the English language. My half-brother was legally adopted by my Mother’s sister. My Mother is his biological Mother. I’m not sure how I should connect him in my Tree. Any suggestions would be appreciated. Most family tree (sites & software) nowadays have the option for you to be flexible (which is needed) when dealing with situations like this. You may label your half-sibling as having been legally adopted by your maternal aunt. She would then be listed as his adoptive mother while he’d show her as having adopted him. At the same time, your and his mother would still feature in his line as his birth mother. Another suggestion might be for you to look at blended family trees. Those usually show step-mothers/fathers, but the point is to get an idea of how trees might look when step-siblings are involved. You can always adjust templates to meet your family’s unique dynamics. In the modern age, I have found DNA cousins whom I happen to know exist because of a family member having participated in fertility clinics, etc. They probably will never know their true biological parent, as no adoption ever took place. Is there a way to handle this in a Family Tree? I wish that I had a profound answer for how best to approach this, genealogically-speaking. I’m going to steer you to a site called DonorChildren.com. Their primary purpose is to assist in creating support, validation, and connection with anyone involved in the donor process. They have a wealth of resources (http://www.donorchildren.com/resources) that might be of assistance to you. I am creating different tree names relating to me. Do I use my name as myself for every tree I have? Another question I have. Do I use the name as far back as I can go on a different tree name? Instead of creating different tree names do I just add on my main tree line as me and add to it? I’d highly recommend that you read this article–“How to Properly Record Names in Genealogy” (https://www.thoughtco.com/properly-record-names-in-genealogy-4083357). It would also help for you to keep in mind one of my favorite rules for creating any sort of genealogical trees/charts/etc. : Consistency is key. Yes, you will take names as far back as they can go. As anyone can tell you, though, names can and do change for many reasons. For your “main” tree, I’d recommend that you do what you stated–start with yourself and branch out as far back as you can go. That’s half the fun of genealogy work–see that family tree of yours getting more and more names of people who helped make you who you are! I wish you the best in your efforts! Hi, my question is this: My great grandfather married his first wife, who died a year later. They had no children. Should I be in her family tree? I’m glad that you brought this up! Your great grandfather’s first wife would not have you in her family tree, but she should absolutely be in yours! Since she bore no progeny, her tree would exclude you. However, since she ties in to your line–via marriage to your great grandfather–I would absolutely include her in your tree! Though the marriage may have only lasted a year before she passed away, her connection to your great grandfather has her as an important part of your family’s story. “We all matter in this rich tapestry of the human family.” –Steve Rockwood, FamilySearch CEO.